Provides gentle, even soaking as water "weeps" through thousands of pores Saves water by reducing evaporation and targeting specific areas that need to be watered. 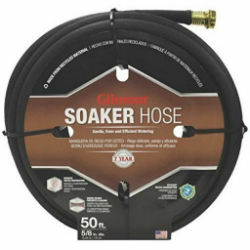 Fexible hose provides precise watering around plants and beside flowerbeds. Use above ground or buried. Durable nickel plated couplings for extra strength at the connection points. Weather and wear resistant. 100% recycled vinyl.